Spur of the moment trips are always the best. I was at work on Thursday when I decided to take advantage of the nice weather and take Friday off. When I talked to my friend who lives close by, she said she was headed to Chicago over the weekend for a meeting. “Take me with you!” I exclaimed. Next thing I know, I booked a flight and jetted off to my favorite city for an impromptu weekend trip. After I’d packed and was killing time before heading to the airport, I decided to make a quick snack that would not only be great for the flight but could easily be tossed in our bags as we roamed the Second City. 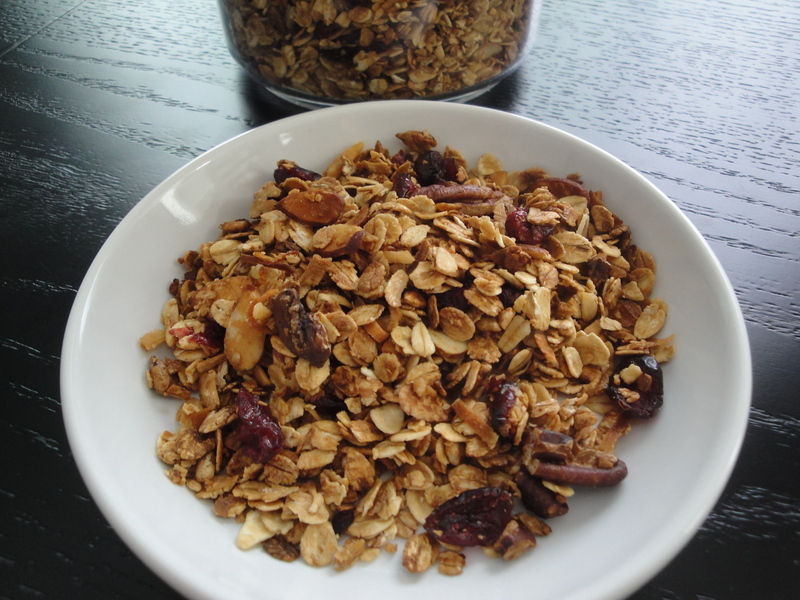 Easy Granola is nutty, slightly sweet, slightly salty and well, easy! 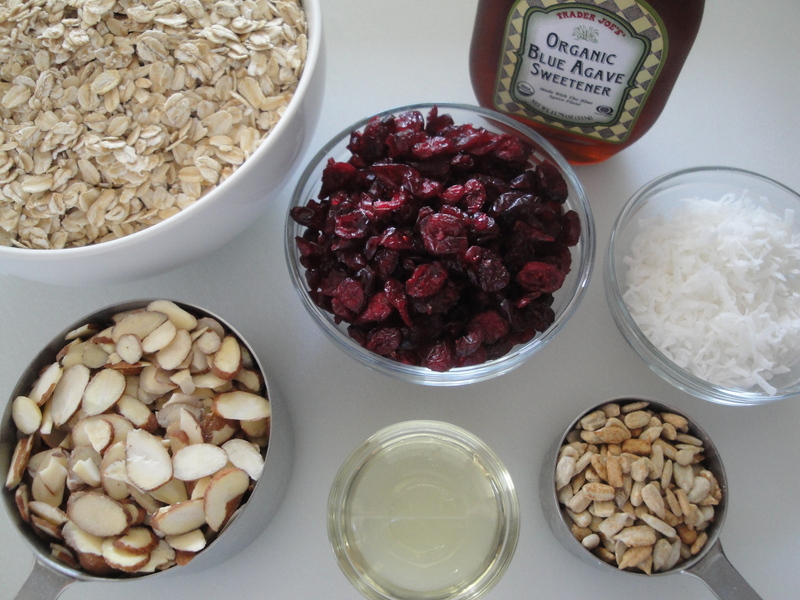 Oats, almonds, sunflower seeds, and coconut are mixed together with syrup and a little canola oil and baked until golden brown. Dried fruit added at the end provides a sweet, tart, and chewy delicious touch. I used a combination of almonds and pecans since I had them on hand so feel free to use any combination of nuts like walnuts, macadamia, cashews, etc. I also used less coconut since I only had sweetened coconut on hand and didn’t want this too sweet. 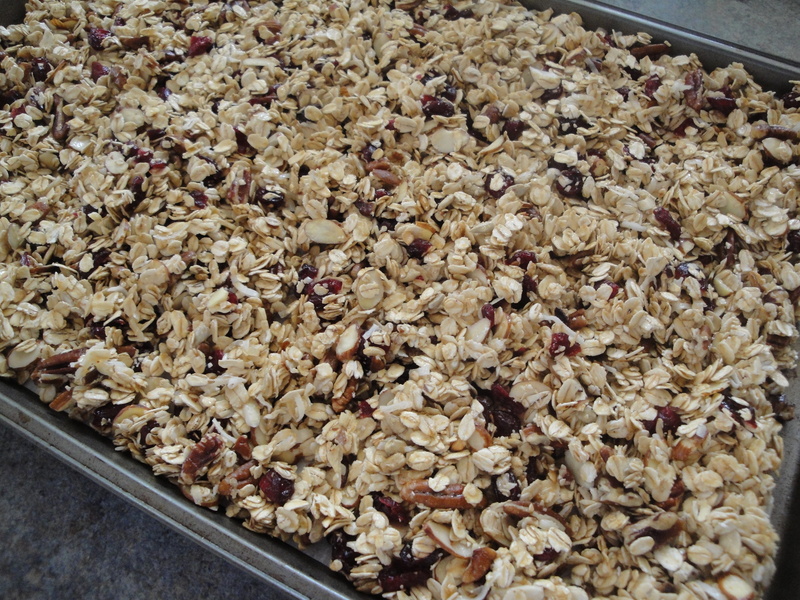 I used dried cherries but any dried fruit – cranberries, blueberries, apricots – would be delicious. 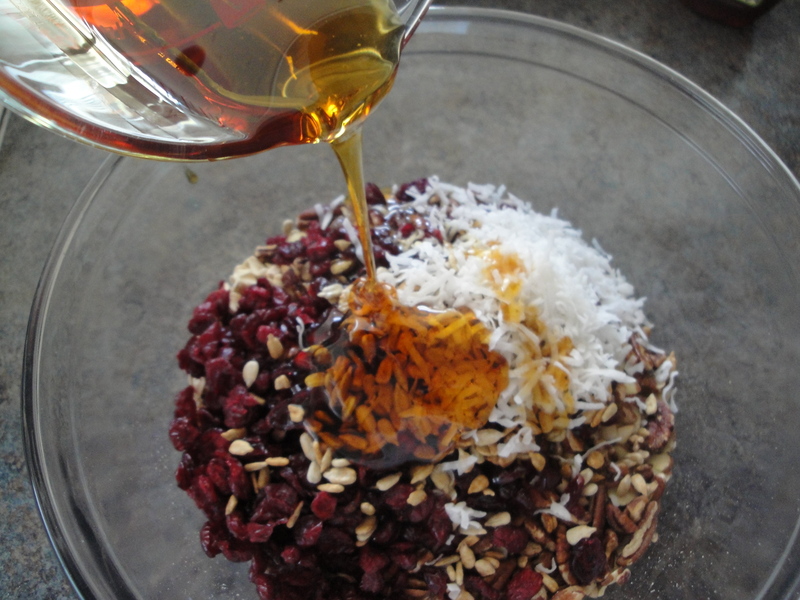 And lastly, I substituted blue agave syrup for the maple syrup since I had that on hand also. This is such a versatile recipe that any combination of nuts, fruit and syrup with make this a delicious snack. 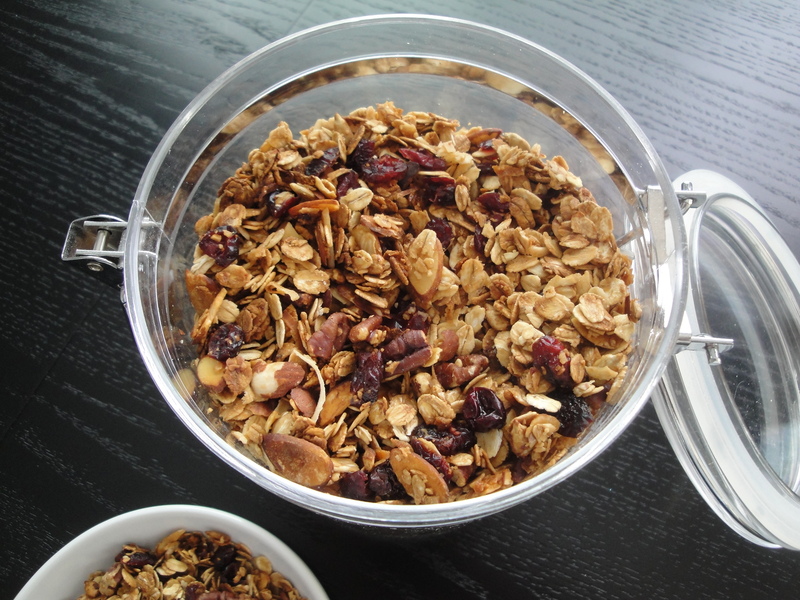 Keep this stored in an airtight container to eat as a snack or toss in with yogurt or over ice cream. This kept us going all weekend! 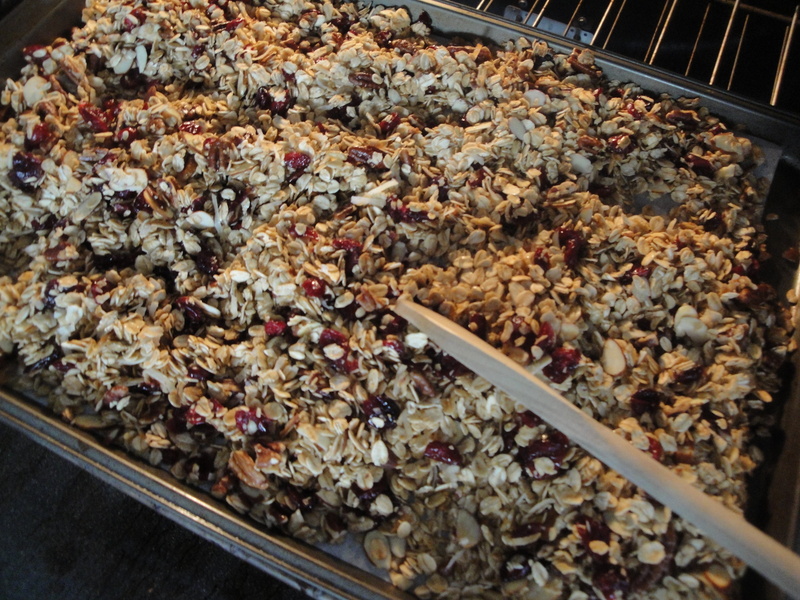 Spread mixture onto a large baking sheet and bake in a 350° F oven for 25 minutes. Toss the mixture once during baking so the edges don’t burn. 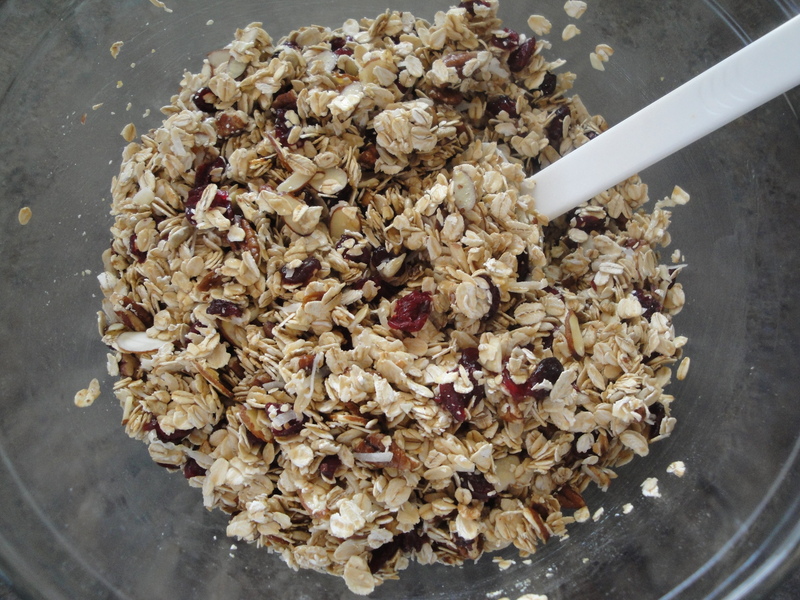 Add in the dried fruit and allow mixture to cool before storing in an airtight container.